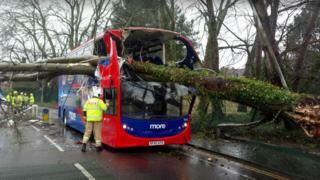 Passengers and a bus driver had a lucky escape when a tree fell on to a double-decker bus in strong winds in Poole. Dorset Police said the tree crashed through the front of the upper deck of the vehicle while it travelled along Ringwood Road shortly before 12:00 GMT. 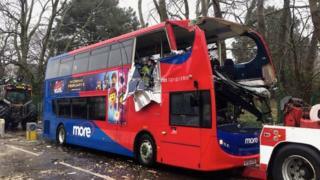 Morebus said five passengers and the driver were on board at the time but no-one was injured. Ringwood Road was closed to traffic while the bus was recovered and the tree removed. A hairdresser working at a nearby salon said she heard a “massive bang”. 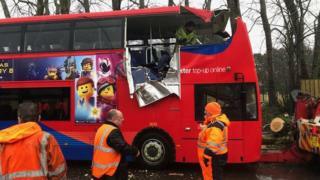 “We looked outside and it looked like the tree just collapsed on to the bus so I just called 999,” Katie Seal said. Dorset & Wiltshire Fire and Rescue Service said two crews attended but were not required as no-one was trapped. Storm Erik brought strong winds to parts of the country on Friday and more rain and unsettled weather is expected through the weekend.